Today the most active Buddhist center in Buryatia is the Ivolginsk datsan, located some 20 kilometers to the south of Ulan-Ude near the Ivolga River. 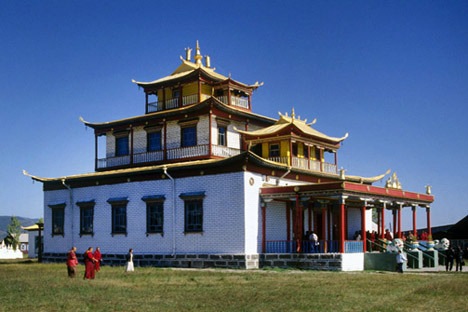 Founded in 1946, after the destruction or closure of Buddhist monastic communities in the 1920s and 1930s, the Ivolginsk datsan follows regional Buddhist principles in the structure and decoration of its temples, shrines, and libraries. The main temple (tsokchen dugan) was built of engineering brick in the late 1940s and has the traditional multi-leveled upper structure. The monastery’s other buildings are for the most part built of wood and painted in bright polychrome patterns. Within this sacred compound, Buddhist art and ritual merge with the dramatic landscape of Buryatia.